Having lost my mother at a young age, I thought I would appreciate this book more. Perhaps I need to be older. Perhaps I knew already how much my mom had given up early in her life. 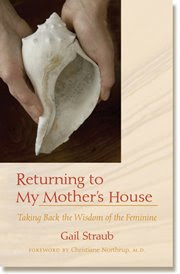 Returning to My Mother's House: Taking Back the Wisdom of the Feminine by Gail Straub is not a bad book, it's just not totally for me. It could be for you thou and I do believe that. Gail has done some amazing things with her life, especially the sheer number of women she has helped take control of their lives. You can tell that from this book. You can also tell that she learned a lot from reviewing her mother's life. That's what the book is about. Gail traces her mother's path from a free-spirited artist to a suburban mom caught in the "Catching up with the Jones" race. It doesn't take place in the 1990s where many of us my age might think this race began, not even in the greedy 1980s. It happens in the picture-perfect 1950s. The book is something of a mystery as well. Gail must piece together her mom's live from her memories and the memories of others. Did her mother lose a piece of herself by trying to be like everyone else? Did second-wave feminists make a mistake by spurning feminine ideas for the rat-race of pro-woman life? And are we today competing ourselves into the ground? Do we even know that we're competing? Perhaps not with our neighbor, but with some high ideal that we'll never reach? It was a touching read, but I feel like I didn't get the message that Gail had hoped I would get. Perhaps I'm too attached to my hamster wheel. And that's not sass talking either. I've run from the feminine my whole life that I don't think I'm ready to embrace it the way that Gail wants me to do. Yes, ironic for the gal who is a tree-hugging goddess worshipper. You can get Returning to My Mother's House: Taking Back the Wisdom of the Feminine from an independent spirited bookstore or Powell's. OR you can comment below and you'll be entered in a giveaway of my copy. Believe me, I treat all my books nicely. Enter by Sunday March 15th for a chance at your own copy.